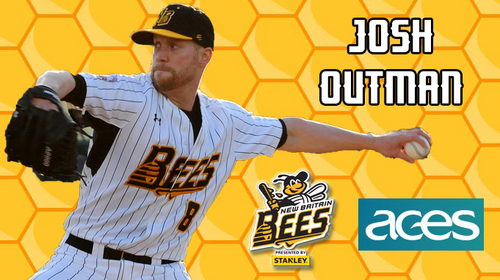 (New Britain, Conn., June 1, 2018) – The New Britain Bees today announced the signing of pitcher Josh Outman. Josh Outman returns to New Britain for his 13th year of professional baseball, third in the Atlantic League, and second with the Bees. Last season, the former big leaguer appeared in two games with the Sugar Land Skeeters before heading to the Mexican League, where he split time between Monclova and Puebla. In 17 combined appearances (nine starts) between the three teams, the lefthander posted a 7-1 record with a 4.58 ERA and 39 strikeouts in 59.0 innings pitched. During his Atlantic League debut with New Britain in 2016, he collected a 3-3 record with a 4.24 ERA in 14 starts. The 33-year-old was originally selected by the Philadelphia Phillies in the 10th round of the 2005 MLB draft. After four seasons in the Phillies organization, he was traded to the Oakland Athletics, where he would make his Major League debut in 2008. Outman would spend two more campaigns in the Majors with Oakland in 2009 and 2011, before playing for the Colorado Rockies from 2012-13, and then splitting time between the Cleveland Indians and New York Yankees in 2014. Over the course of 161 appearances (32 starts) in six big league seasons, he owns a 16-11 record with a 4.43 ERA and 226 strikeouts in 274.1 innings of work. In 219 career minor league games (123 starts), Josh has posted a 59-33 record with a 3.41 ERA and 727 strikeouts in 798.2 innings pitched.